My family loves breakfast. The problem is I am not a morning person. Well, it is not that I am not a morning person, it is more like I am not a breakfast person. I have never been much of a breakfast eater, and I doubt I ever will be. I know breakfast is important, and I have tried to eat it on a regular basis, but food first thing in the morning has just never set well with me. However, my family is the total opposite. They all wake up hungry and are always ready for a good breakfast and that is a good thing. I know breakfast is important and good for them. Because of this I am always looking for quick and easy breakfasts and breakfasts that can be made ahead. 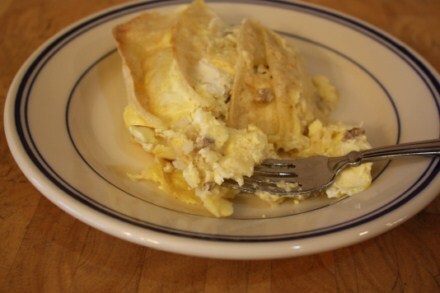 This recipe today is a make ahead breakfast that I have been making for years. It is a recipe that I found in a Taste of Home magazine at least ten years ago. I have adapted it some over the years, but it is the same basic recipe. I love this because it can all be made the night before and all you do is put it in the oven in the morning. I love recipes that make breakfast so easy like that. In a large bowl combine meat and 1 1/2 cups of cheese. 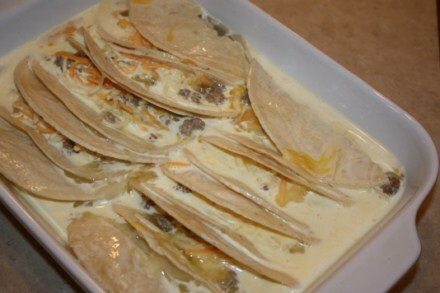 Place filled tortillas into a 9×13 pan. In a bowl combine eggs, half and half, and salt. Mix together well and pour over filled tortillas. Sprinkle remaining cheese on top. Cover with foil and refrigerate overnight. In the morning, remove them from the fridge and let stand at room temperature for about 30 minutes. Bake covered at 350 degrees for 25 minutes. Uncover and bake about 10 minutes more. this would be an awesome use for crumbly corn tortillas. Around here, corn tortillas always get shoved to the back of the fridge until they are falling apart. I love the variety and simplicity of your recipes, so I nominated you for a blog award – Versatile Blogger Award! Oh, I so relate to that, I just cannot do food first thing. I need at the very least an hour, maybe two, before I can eat. Rest of the family is ready for as much food as they can get their hands on as soon as they open their eyes. I make up batches of things that can be pulled out of the fridge or freezer to get on the table quickly because I don’t even really like to handle or smell food too early. This looks like it could be one of those things. Sounds delish! Can’t wait to try it. This was a hit at my house! My husband and son raved about it. I made half a recipe and it was gone in no time. Next time I’ll make the full pan! @Nadia, I am so glad that you liked it! Thank you for letting me know. I’ve got this one bookmarked – with dozens of eggs in the fridge (it’s spring at the farm!) I’m always looking for new egg recipes. And with company coming – I love the make ahead kind! Ever tried making it and cooking right away instead of the overnight wait? It turns out great!! Portioned leftovers for quick breakfast before school! Thanks for the recipe, it’s a keeper! Thanks for letting me know. I am glad that you enjoyed it!